I just can’t help myself. I know it is not Thanksgiving until Thursday, but I have already started thinking about Christmas. 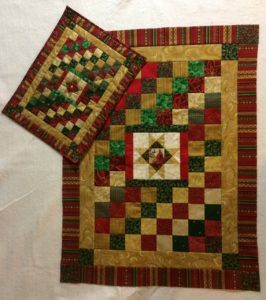 Of course, when I think about Christmas, I think about quilts, so today I have two new patterns to share with you. The samples will be in Wooden Spools on Wednesday and the patterns will be available at the same time. The first one is called “Up to the North Pole” (10.5” x 14.5”). I apologize that the lighting is still poor. My son came to visit for 2 weeks and he is an electrician and will be installing new lighting in my quilt studio. Hooray! 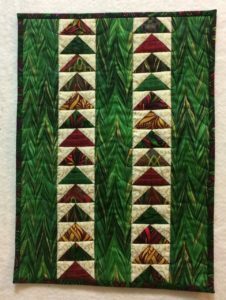 This fun little quilt can show off some of your favorite Christmas fabrics or you can buy new ones! It has two rows with 14 Flying Geese in each row and then there are three strips of your favorite fabric separating them. I think you will find that it goes together quickly so you might want to make more than one. The next quilt is simply called “Little Christmas Quilt”. 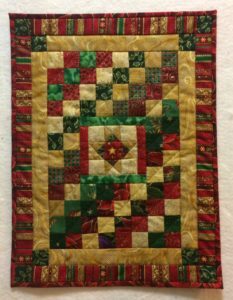 It features lots of red, gold and green scraps that go together well. The first picture shows it in the original size which is 12” x 16” and this is perfect to hang in a little wall space or put on a table or drape over the back of a chair. But I decided some might like it a bit larger, so I also have directions in the same pattern to make it 24” x 32”. You can see the difference in size when I put the two quilts together. The larger one makes a beautiful wall hanging and will bring the season into any room where you display it. One more quilt I wanted to share is a quilt I made this past week. Unfortunately, I cannot turn it into a pattern because it is not my original design. I saw a picture on Pinterest and just had to make myself one because I thought it was so festive and cute. I wish the person who posted it had given credit to the designer but there was no information. 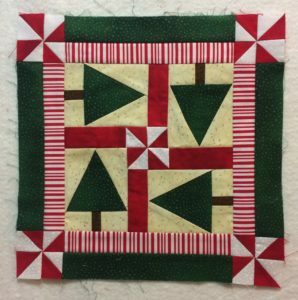 I love this little one (12.5” x 12.5”) because it reminds me of Peppermint and Candy Canes. I hope you can enjoy getting out your Christmas quilts and decorating this next week or next month! Maybe you will find time to make a new one or two.